Words, like people – and other significant energetic situations – have range. They can be many – sometimes completely opposite – things all at once. “What you should be”, for example. “Should” is language’s loaded gun of outside opinion. And no one preaches more against the “should-ing” of existence than Adam Lambert. But preface with “imperfectly – as happens in the Broken Open lyric “So imperfectly what you should be” – and “should” shifts from criticism to wise counsel. Reminding that you’re fully equipped with creativity’s all-important foundation: Imperfection. And that’s why “imperfect” is exactly “what you should be”. Fortunately, imperfect is the only kind of human there is. Forget battles with the shadows, “imperfect” is your creative birthright. There is no One Right Perfect Way you “should” be, except as the title suggests – when you’re ready – “Open”. “Open” is the opposite of “should”. Open can receive. In fact, if anything is “broken” about you at all it’s that you’re trying to hold onto the impossible “should”. And the only way to fix that situation is to get broken. Drop your guard. Let go. Intwine in a new intimacy. Or as we like to say at Creative Astro School: Welcome to studying your Moon’s Nodes. 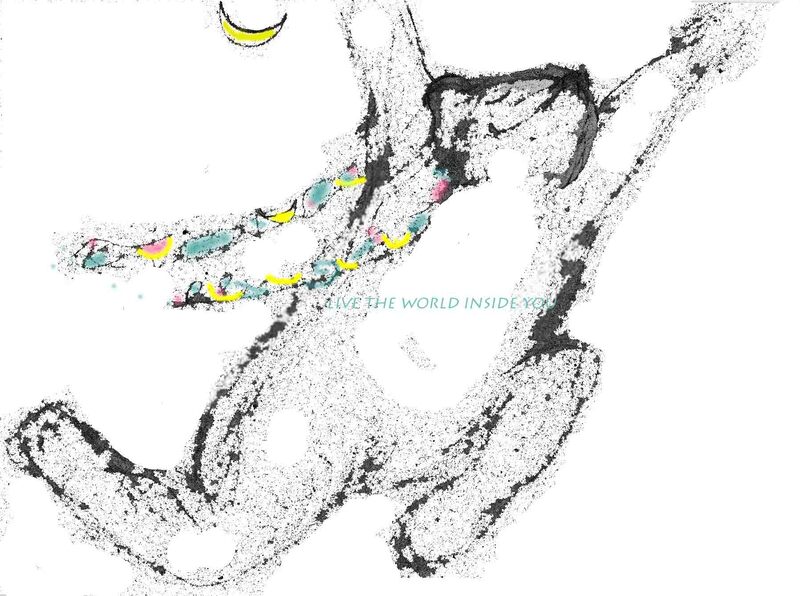 This First Classroom on the Moon’s Nodes launches a deliciously clarifying exploration of spectrum, duality, authenticity, and “What You Should Be”. Where you will come to understand that there is no One Right Way to Be. Except open to the opportunities of openness. And you will discover a new intimacy. A rich and powerful true heart connection. Right where it should be: With Yourself. The Moon’s Nodes are the Zodiac’s heralds of energetic higher learning. There are two of them: South Node and North Node. They are polar opposites, always precisely 180 degrees across from each other in a Natal Chart. And like many seemingly opposite energies, they are actually connected. They form an energetic spectrum. That is the most important thing to remember about the Moons Nodes. They are an energetic spectrum. You can’t have one without the other. While there will be many times when you choose to focus on just one Node, the other will always be part of the picture. Symbolically, the South Node reveals energies in your make-up that feel innate, easy, second nature, “effortless” (® Slash, about Adam’s vocal virtuosity). The sign, house placement, and aspects of your South Node represent things you can do without thinking. Things no one had to teach you to do. Energies so easy, you might over use them, fall back on their sure fire winner results. Sometimes, to the point of joy-clipping rut. The North Node is the polar opposite: Unknown energies. The sign and house placement of your North Node represent things foreign – in some cases to the point of clueless. Yet, these energies, as unknown as they may be, pull sharply, especially the older you get. They beckon. They’re energies of longing, yearning, desire, and recognition of needing to know, must know, really, truly want to learn what they are. Sometimes, to the point of paralyzing, fear-steeped, run-the-other-direction, denial. Oh, no, that can’t be me. And if it is, won’t I lose all this works-every-time good stuff? The karmically-inclined deem the South Node what you came into this lifetime already knowing. And the North Node what you “need to learn” over the course of this lifetime. The cosmically-inclined consider the Nodes a nice love letter from the Universe. With the South Node being special presents that will help you build a foundation upon which, one day, you will stand and reach for the bigger blessings of the North Node. Others think of the Nodes as a reminder of Purpose. An indication of that part of the Totality that each of us is here to personally transform. Not just “Permission Granted” to be what you long to be, but “Duty Assigned”. Energies you can shift inside yourself and thus help lift us all higher. The psychologically-oriented among us, with fervent belief in Free Will, consider the Moon’s Nodes a Path to Wholeness. Energies that we do not know, but if True Authentic Self is our goal, the energies we most truly need. You Can Only Learn What You Don’t Know. However you choose to consider the Moon’s Nodes symbolically, their energetic spectrum offers a rich, deep theme of lifelong learning. The energies of the North Node are, for the most part, unknown to us early in life. In fact, sometimes earliest life situations seem almost set-up to make sure our only focus is our South Node. And that the polar opposite energies of our North Node an impossibility. Thus, studying our North Node can reveal many birthrights that are ours to claim. When we have experienced enough to be open to more. But these energies must be learned. There is no easy acquisition of your North Node’s life-enhancing energies. But doing the work to discover them is worth the treasure. And if you do consider life to be one long, creative learning opportunity, the North Node is not just your PhD, it’s post-doc, post-post doc, and then going on to become Chair of the Department of Doing It Perfectly Authenticity. Because when you reach for, and not just integrate, but celebrate the energies of your North Node, you will – sometimes to your great surprise – find yourself living in the creative freedom of being truly, completely, gloriously – and most importantly imperfectly – what you should be. The South Node symbol looks like a curly U. The North Node like a upside-down opposite of that. Doesn’t matter if your chart only shows North, because know one Node, you automatically know the other. Because they are always 180 degrees across from each other. 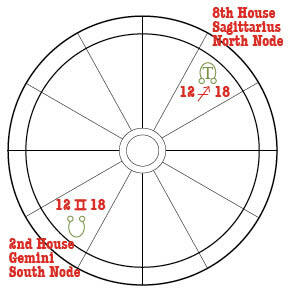 Thus, if your North Node is, for example, shown at 12 SAG 18, then your South Node is directly across the wheel from that, at 12 degree and 18 minutes of Gemini. Learn more about Astro School here. Pre-School Basics, in First Lessons in the Menu Bar, or here. Report from Glam Nation Tour Launch that launched the School here. A friend did my chart for me ages ago, and with Astro School I’m finally figuring out what all those little symbols mean! Fascinating. I still don’t completely understand my particular North/South Node meaning, so brb googling. Thanx! We’re just at the beginning. But any learning you gather about the Archetypal energies represented by the signs & houses of your Nodes can be considered. Though, as always, you’ll be the ultimate determinant of what is useful and meaningful for you. Our lessons, like the Zodiac Wheel, will be circular. As more is learned, you can come back to each class and go deeper.